Last week I profiled 8Tracks — an internet radio station full of writing playlists. But playlists are, and have been for many decades, a big thing for many people. Nowadays with the freedom of selecting a lot of free music to listen to, many readers are also getting into the game of assigning music playlists to their favourite books. But at least one service is now available to give authors control over what sounds might be associated to their own books. Listening to music as you read is hardly a new thing. Back in the 80’s as one of the first generation to be raised on television, when studying for my Secondary School exams, I got on better with a radio station blasting purple-noise (not white-noise, for some reason I think of radio babble as purple) in the background. My teachers were still of the “you must study in silence” ilk at the time. Now I have a passion for movies, and one will win me over easily if it’s got a good soundtrack. A large part of Guardian of the Galaxy’s success must be put down to that soundtrack of 1980’s music – retro for much of the audience, but down memory lane for many of us. 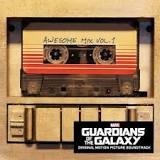 The Awesome Mix Vol. 1 is one of the most popular collections sitting on many of the streaming services listed below. Users, viewers – and readers – are now demanding an immersive experience which includes not only text, but audio themed to what they are reading, and many are going out there to produce this themselves. 8Tracks is only one of many music streaming services where many of us can select and listen to a large collection of music and playlists. Alternatives include Spotify, Pandora, Last.fm, and of course YouTube or Vimeo where many bands release their first tracks in advance of new albums. 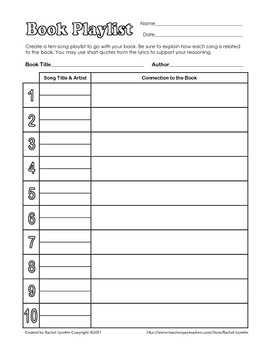 Free worksheet for students via Teachers Pay Teachers. User defined playlists sit on all of these and many more. And for reading, reader groups are also putting together playlists for their favourite books. 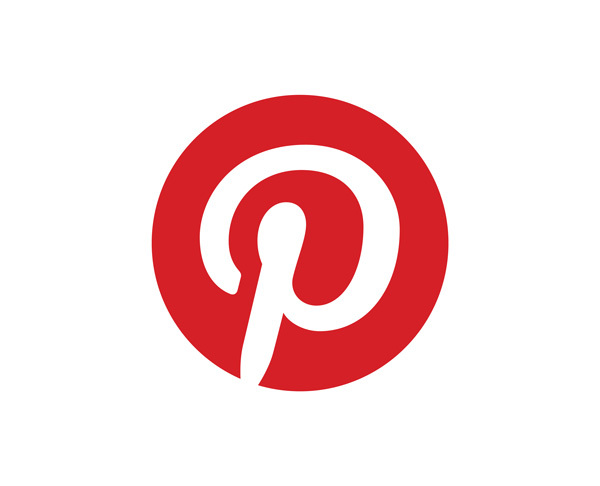 Here’s one example discussion in the Goodreads Young Adult forums – playlists for books. I must admit that I haven’t heard of half the music put forward for some of the books, nor am I aware of some of the books – but the readers are, for sure. Of course, including audio and even video in an enhanced ebook is certainly possible nowadays, and part of the initial wowza applauds for when ebooks became more mainstream – except most of us as ebook readers, don’t go for the rich media we were promised, even when available. That’s because it all comes at a cost of download bandwidth, and storage. As authors we can’t go out with a Hollywood producer’s budget and purchase – or have made – a full music playlist with royalty payments from musical artists. Nor can we create a playlist through one of the music streaming services above, and have control over enforcing it for our books. But through Booktrack we have some control over the ambient and musical sounds associated directly in our text, should we wish. The Booktrack bookshelf through iPad app. 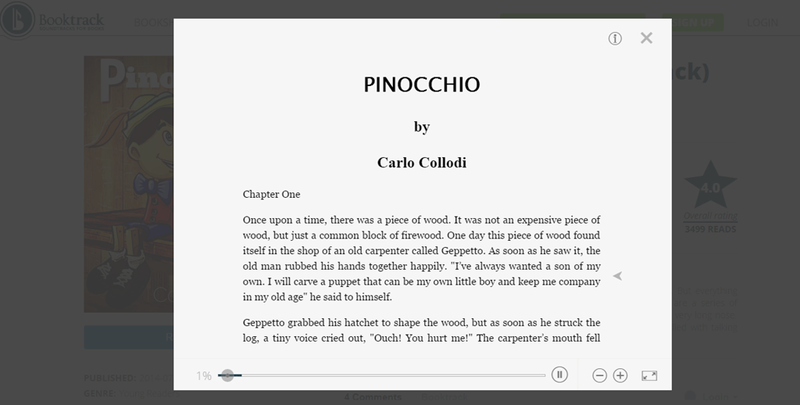 Booktrack is a service that promises to give self-published authors the control over adding a soundtrack to their ebooks. The service provides both an e-publishing platform and an e-reader app which plays through iOS or Android devices. If you open Booktrack through Chrome, FireFox, Opera or Safari browsers, you can also buffer and read the free books from the site directly. The free app allows people to record or purchase licensed audio (so not only music but sound effects too) and insert these into the text of an ebook. Typically this would be to the first chapter of your selling book. So the booktrack books work as a promotional offering, with links to external retailers (Amazon, B&N etc) where readers can find the full book to continue with. 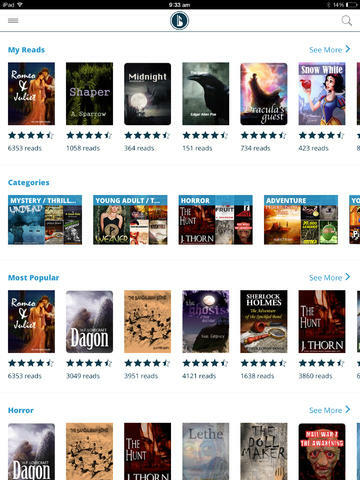 Future Booktrack features will include the potential for Authors to sell full Booktrack books through the store, but at the moment using the apps to read or create Booktracks is totally free. The books then must be accessed (and in the future, sold) through the Booktrack Bookshelf online, which includes hundreds of the typical royalty-free classic literature books available in the domain. Note that many of these free-to-use classics are only available as excerpts or first chapters, where soundtracks have been initiated by the Booktrack team. Readers are also required to scroll through pages with arrow keys, but reading rates can be changed to speed up or down the little arrow key which flows down the text to show you where your reading and listening focus sits. However, there are a fair few “completed” books available, including Sherlock Holmes, H.P. Lovecraft’s Re-Animator and Beatrix Potter’s Peter Rabbit. I’ve linked you to Peter Rabbit, so you can read it through your browser, and appreciate just how fun the environment might be. 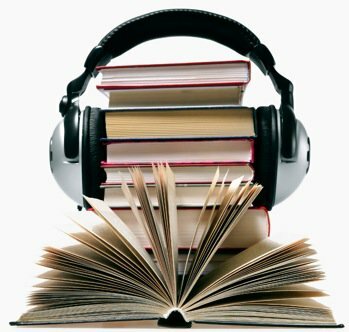 The audio contents play when you hit that particular reading section of the book, within your device or browser, so typically you would read the book with headphones on. You also require an internet connection, as with any audio streaming service. As an author creating Booktrack documents, you must uphold the terms of the service, which requires that you hold licenses to use any audio files you insert into your text. This means you won’t be able to use popular music tracks owned by musicians out there, but can source music and effects from many of the music publishers out there. Audio files are limited to WAVE format, 16 bits, and a maximum size of 50MB, so your books will also be limited by those conditions. But if you’re after creating a more immersive experience for your reader, Booktrack is a good start. Illustration by Mikey Burton, via Fast Company Booktrack article. The era of crotchety old ladies yelling “Turn down your book!” draws nigh. 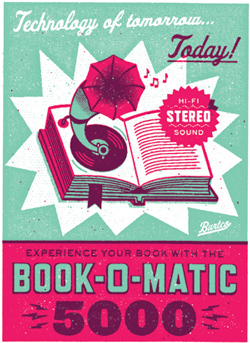 Booktrack also supplies a large library of usable sounds for your books. This also provides an interesting thought for those currently writing a book – if you do this through the inbuilt text editor, you can use the sound library to provide inspiration. As a content creator, there are two packages – a teacher/classroom signup, or the Booktrack Studio. You can signup using social media credentials, and currently it’s all free. #52Tech: This was Week 42 post in the #52tech goal – to investigate and share one technology post once a week for 2014. The loss of my writing mascot Mickey this week has left me unable to function totally in writing, which is difficult given my intentions to participate in NaNoWriMo again this year. But at some stage soon I must force myself back into the prewriting phase and prepare to a certain degree for the marathon. As a former extreme plotter I’m more relaxed about outlining and planning nowadays, having realised my propensity for overdoing it and losing my passion for the story. I’m more flexible and use different creative techniques for coming up with characters or plot basics, but am always thankful of helpful tools for this work – particularly if they’re cheap or free, and accessible. The Hiveword Online Fiction Organizer and Charahub are two webapps which fit both criteria, and could be perfect for NaNo prep. If you write in MS Word, and deal with e-publishing, or collect ebooks, you most probably are aware of the free app, Calibre. With Calibre 2.0 recently released there’s even more of a reason to have Calibre on your system. It’s got editing functions. Anyone watching the net lately will be well aware of Tom Hank’s typewriter app hitting the iOS appstore and smashing records for the productivity and overall categories. I’ve left it a couple of weeks before profiling the Hanx Writer App and alternatives. Last week I profiled one web-based outliner, Workflowy. For week 34 of the #52Tech series, Fargo and some other alternative webapp outliners are highlighted. For week 33 of the #52Tech series, Workflowy is highlighted. Firstoff – I’m not a huge fan of Workflowy anymore. Some other reviewers have loved it, others hated it. Workflowy – or any outliner – is a bit like vegemite in that respect – you either love it or hate it, there appears no middle-ground. If you don’t get on with the Workflowy format, in Week 34 I’ll be profiling some alternatives. I personally don’t tend to use a lot of writing prompt generators. At this moment in my writing career I have a problem with having too many ideas to pursue. But prompts are part of many writer’s daily writing arsenals, useful for many tasks, practise and kicking our muses into gear. Here’s a very short post on two LARGE sources of prompts, and a couple more. There are many more out there, so feel free to comment in with your own favourites. A couple of weeks back Poetica became open to signup for everyone, after some private beta testing. This chrome based web app is worth consideration if you’re after collaborative editing on any web copy you produce. This is the final post within the three week Productivity series, and also falls as Week 30 for the #52Tech Series. This post is a random collection of further systems and tech associated with some of the topics covered over the productivity series. You will find tools to help out in email zero’ing, timing and prioritising tasks and further resources on productivity. This is a Productivity Fortnight Bonus post, with tips in using Evernote for more efficiency as a writer.